Prime Trailer Leasing is gearing up for 2012 and purchasing 50 or more 2004 Hyundai dry vans for resale out of Texas. With the growing demand for late model equipment, Prime Trailer Leasing has bought an extremely clean, fleet-maintained group of dry vans for resale opportunities nationwide. In February of 2012, Prime Trailer Leasing purchased at least 50 2004 Hyundai dry vans to re-sell to customers in Texas and the rest of the nation. Though there are many dry vans for sale in Texas, Prime Trailer Leasing has purchased some of the cleanest 2004 dry vans in the market. Fleet-maintained and offered at trade terms, Prime is offering these at incredible pricing to wholesalers, dealers, and retail customers. The 2004 dry vans are equipped with air-ride suspension, swing doors, galvanized rear frames and aluminum roofs. With incredibly clean interior and exterior walls, these trailers are already selling well. In the current semi trailer sales market, used equipment is being sold at a premium, and for dealers and companies who can provide affordable pricing to the end-user in a reasonable time frame these trailers are a great purchase. Many fleets are upgrading their equipment from 2002 and older equipment to affordable 2004 to 2007 models to keep their capital expenditures at a reasonable level in this unstable economic time. 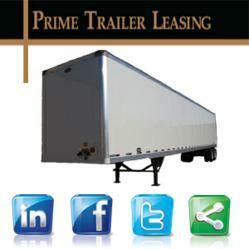 Prime Trailer Leasing is dedicated to providing excellent equipment at superior value. This current acquisition of 2004 dry vans is no exception and should really help them provide value and equipment to their customers in need across the entire nation.